Quest to grow human organs inside pigs-- the headline says it all. Google those words ,and you'll come on many links to the same research, including Youtube and photos. By the way, "chimera" is the term used for human-primate hybrids -- that is chimps and the like, which are around 98% or more genetically similar to humans. I suspect the term chimera is being extended to cover other types of combinations . . . and if you Google onwards you'll see much more. I'll add some more here another time. Another related term is "transgenic"-- also something for another time. Still another related term is "Radical life extension." I suspect these human organs "carried" in pigs and other animals are going to become a very big deal for the regenerative medicine industry. I think they are also going to be a much-discussed topic in the area of medical and research ethics. 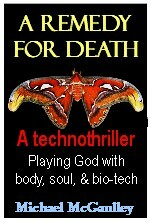 It's relevant here as my technothriller A REMEDY FOR DEATH begins with the attempted creation of a human-chimp hybrid. 'Nuff said. Organ regeneration, bioartificial organs, regenerative medicine, and the related possibility of 3-D printing of replacement human organs are all grist in my science technothriller, A REMEDY FOR DEATH: Playing God with body, soul, and biotech. The artitle, "Bioengineer: the heart is one of the easiest organs to bioprint, we'll do it in a decade"--in Wired UK, by Liat Clark, focuses on work led by Dr. Stuart K. Williams at the Cardiovascular Innovation Institute at the University of Louisville. The team has already bioengineered arteries and other blood vessels within the heart. Now they are at work on producing a complete heart, which he estimates can be done within a decade. Here's his overview of the process (as it would work a decade or so from now): "a patient enters the operating room and tissue is removed (we think fat is the best source) and regenerative cells isolated. The cells are then mixed with solutions that contain extracellular matrix molecules and other factors and placed in the bioprinter. The bioprinter then prints the heart." A week or so later the bioprinted heart is ready to be implanted in the patient. We've alredy written in these pages about other ways in which 3D printers are being used to print replacement human organs. Also, check "Categories" in the sidebar of this blog to see several other posts here to bio-printing human body parts, as well as the use of human stem cells as one of the input materials. Suppose you could regrow that tooth you lost to (a) a fall, (b) cavities, (c) a bar-room fight? Well, someday you may be able to do just that. Here they took "epithelial" cells from humans --from their gums. Grew those cells, then mixed them with "mesenchyme" cells from mice. The result was transplanted into mice, who then grew hybrid human/mouse teeth, with roots. "The mesenchyme cells" were cultured to be 'inducing' --they instruct the epithelial cells to start growing into a tooth," says the BBC article. Alas, this is still early experimental. The process is expensive, and not likely to produce working results in the near future. You'll see a photo of one of the resulting teeth taken from that chimerical mouse (a chimera is a blend of human and animal elements). And it was just last week that we posted here about human brain cells being implanted into mice. Mice implanted with human brain cells become smarter--Discover Magazine! I know there's a lot of worry going around about what if computers got smarter than us humans and took over. But now I'm REALLY worried about mice that are too smart for our good!